I know, I know. I’m not on vacation anymore, but when industry veteran Hubert Horan sent me this rebuttal to Evan Sparks’s piece, “Why International Alliances Are Good for You,” I just had to post it. What do you think? I was in charge of international network planning and scheduling at NWA in the early/mid 90s, and developed the first (NWA-KLM) alliance network in 1993. Within 18 months we expanded hub-to-hub flying from 2 to 9 daily flights, establishing the network model subsequently copied by Delta-Swissair (in 95) and United-Lufthansa (in 97). I later spent four years at Swissair/Sabena, so I have worked these alliances from both sides of the Atlantic. I’ve not only built up alliances that actually worked from a customer/financial standpoint, but I’ve helped shut down alliances (America West-Continental, the European Qualiflyer alliance) that didn’t. In recent years I’ve published a variety of articles on alliances, the dynamics of international competition, the EU-US treaty negotiations, and related topics. Thus when I say that the arguments in the 13 April post “International Alliances Are Good For You” demonstrate a profound ignorance of international airline competition and the economics of airline alliances, there is a substantial body of analysis and experience behind my claims. The current applications for alliance antitrust immunity will completely end meaningful competition on the North Atlantic. 23 airlines that used to compete independently have applied to the US and EU governments to consolidate into three Collusive Alliances. There are active press reports that two others may join in the near future (see list below). The three Collusive Alliances will control 97% of all North Atlantic traffic. The three groups would function as a North Atlantic Cartel with the Lufthansa and Air France groups dominating Continental European traffic (75-80% of the total North Atlantic) while the British Airways-led group would dominate the US-UK market (the other 20-25%). None of the members of this cozy Cartel would have any incentive to compete aggressively with the others. The central issue here is whether you think this radical North Atlantic consolidation is “Good For You”, as the author of the 13 April post believes, or would cause lasting damage to consumers and industry efficiency. A few factual points are critical to understanding the economic issues. These Collusive Alliances, which explicitly eliminate competition, function totally differently from the longstanding “Branded Alliances” (Star, Skyteam, Oneworld) which are enhanced frequent flyer programs, and are not anti-competitive. United can collude on prices and schedules with Lufthansa and other European “Star” members, but faces aggressive competition from ANA, Thai, Singapore, and other “Star” members. Reciprocal frequent flyer “alliances” date to the early 80s, long before the Collusive Alliances began. Oneworld has functioned fine for ten years without any antitrust immunity arrangements; if its members were not granted immunity to collude on North Atlantic pricing, Oneworld would continue to function in its present form. The North Atlantic, like other Intercontinental markets, has huge barriers to competitive entry. It is absolutely impossible to compete on the North Atlantic without a large scale hub operation on at least one side of the ocean. This is a pure “network airline” market; no LCC or niche competitor has ever achieved more than a miniscule share of the North Atlantic. Many of the most important airports (JFK, EWR, LHR, CDG, FRA, ORD) are highly slot constrained. Even though there has been active entry and dynamic growth in most of global aviation since deregulation, there has been almost no net entry into the Intercontinental sector in the last 25 years. There is no plausible evidence to support the claim that any anti-competitive behavior by the Alliance Cartel would be quickly disciplined by new competitors entering the market. The three original Collusive Alliances (NWA-KLM, Delta-Swissair, Lufthansa-United) benefited consumers in the early mid-90s by providing improved schedules and lower prices to one previously underserved piece of the market, the so-called “double connect” markets. These St. Louis-Berlin or Jacksonville-Munich type city-pairs, where no one offered “online” service, actually accounted for about 25% of the North Atlantic in 1990. You could fly interline, but fares were high. The original alliances provided good schedules in these markets and the full range of discounts found elsewhere. But by 1997, this market gap had been fully closed. After 1997, the Collusive Alliances didn’t offer consumers any new services or prices that hadn’t been available before. As late as 2003, the North Atlantic had healthy competition and was strongly profitable. The three largest competitors served about 55% of the market; no one had anything close to the “market power” that would permit the type of oligopoly behavior that could harm consumers. The three Collusive Alliances (focused on connect markets) combined had about 45% of total traffic; they competed with each other and with the non-alliance carriers that focused on larger nonstop markets (BA, Virgin Atlantic, AA, US Airways, Continental). Prices paid by North Atlantic consumers have been climbing rapidly (chart below). In the 1990s, transatlantic average fare trends closely tracked US domestic trends. But this changed after 2000; as North Atlantic concentration levels (top 3 share) rose from 47% to 67% in 2007, average North Atlantic fares rose 40% more than US domestic fares. The threat of consumer price gouging will surely increase further as concentration grows from 67% to 97%. Each of the 23 (soon to be 26) previously independent airlines went to the US and EU governments with a petition to either merge, or for antitrust immunity to actively collude on prices, schedules, service and everything else (which is exactly the same as a merger). The big Legacy carriers have invested millions in lobbying and public relation efforts advocating “industry consolidation”. The move to radical consolidation had nothing to do with consumers, efficiency, or “market forces”. The shift from a market where the top 3 competitors had a 55% share, to a world where they have a 97% share, resulted from government officials agreeing with the requests from these airlines to eliminate competition. Why are the current antitrust immunity applications and the larger trend towards radical North Atlantic consolidation Bad for Consumers and Industry Efficiency? Because none of the consolidation since 2003 generated any new consumer benefits or offsetting productivity gains that could have possibly justified the reduced competition. Because extreme concentration in markets with high entry barriers always creates huge risks, and there is zero probability of new competition that would ever threaten the hegemony of the 3-alliance Cartel–Southwest or Easyjet will never invest the tens of billions that would be needed to mount a serious competitive challenge. Because airlines will use the totally artificial profits from the protected North Atlantic Cartel to distort competition in the US domestic market—for example Delta can use these artificial profits to subsidize competition against more efficient shorthaul carriers such as Airtran and Southwest. Because having a radical shift towards concentration totally driven by government action—explicitly favoring the interests of the big Legacy airlines over the interests of consumers, communities and non-Legacy airlines—makes a travesty of the basic principles of deregulated competition and Open Skies. How can the author of the April 13th post, and the Legacy Airline PR people claim that merging 26 independent North Atlantic airlines into a 3-alliance Cartel is Good for Consumers? As witnessed with the financial industry, the fight for airline consolidation has been led by people who claim to be true believers in “free markets” but are actually fighting to get governments to intervene in favor of badly managed (but politically powerful) big companies. The “free market” consolidation argument is really a demand to gut remaining antitrust and regulatory protections for market competition so that those big companies can merge into “too big to fail” global airlines. The “free market” case isn’t based on any data or analysis that can be objectively verified, and insists that anyone who disagrees must be a self-serving politician, if not an evil socialist. People who care about the future of commercial aviation shouldn’t ever tolerate this kind of nonsense. Note 1—the 23 previously independent competitors that have merged, or have formally applied to merge into the three Collusive Alliance groups: United, Continental, Lufthansa, Air Canada, Austrian, Swiss, SAS, TAP, Turkish, LOT, bmi, Brussels into the Lufthansa-led group; Delta, NWA, Air France, KLM, Alitalia, Czech into the Air France-led group and BA, AA-TWA, Iberia, Finnair into the British Airways-led group; Aer Lingus, Virgin Atlantic, and US Airways are also widely reported to be pursuing membership but have not yet formally applied for antitrust immunity. The largest carriers outside the Collusive Alliances would be Aeroflot (0.5% of transatlantic capacity in 2007) Aerosvit and flyglobespan (0.2% of capacity each). I’m sure there’s good info here….. snorzzzzzz…. oh, excuse me! Guess I fell asleep. Does the author have the source handy for his fare data? Kind of hard for readers to try to analyze any other potential trends affecting fares. Dan – The fares are from Form 41 data, so it is centered around US carrier fare data. If you assume that European carriers get higher average fares, then the gap may be even larger. Mr. Horan poses some very compelling counter-points on why alliances are potentially bad. I agree with the thread that airlines are self-serving, paranoid and as desirous of possible of minimal competition and government interference. The simplest evidence is in all of the court shenanigans they engage in when new entrants come along. a) Only NW/KL seems to have divided over-lapping routes to serve their strengths. Only NW to DTW, only KL to NYC, for example. It most certainly is not the case in oneworld where BA and AA continue to fly toe-to-toe against each other from LHR to NYC, DFW, ORD, LAX and BOS. I also see both UA and LH flying FRA-ORD, IAD and SFO. Will AA or BA surrender NYC one to the other for the sake of collusion and anti-trust? Highly doubtful. b) Based on the above, where the carriers do operate against each other in identical point-to-point markets, how are they not in fact still competing internally? Even with revenue sharing the operating carrier would receive the majority of the revenues, would it not? Or have they agreed to simply go 50-50 regardless of who’s metal gets the business? If THAT were the case, then yes, there is a huge danger in such collusion. Otherwise it makes no sense for DL and AF both to serve ATL-CDG, fight against each other and the other alliances for every single passenger and still say they are reducing competition. Without 50-50 revenue sharing they’re still fighting each other whether or not the price is lower (good for consumer) or higher (good for them). If the Big Three end up controlling 97% of the transatlantic it still does not add up to the old Ma Bell controlling 100% of the US telephone market. Mr. Horan points out that within those Big Three are 23 to 26 airlines all fighting for their lives. They cooperate largely at the frequent flyer level but short of the 50-50 argument above I still miss inherent danger he refers to. Consolidate to three primary alliances? Yes. That’s already happened. Consolidate 20+ independent carriers in to three de facto ones? LAX-LHR has VS, AA, BA, UA and NZ. Two alliances and one maverick, with NZ easily being the weak sister of the bunch in terms of market strength. If NZ gets the business does UA get a share of the revenue? The clearest loser here would be VS as the loner whereas AA and BA would say they only lost x-percent of a fare. Further, in at least this example, so long as VS is lurking about I’d say anti-trust on pricing won’t stop them from keeping fares low for all interested parties. Finally, I agree that locking up the North Atlantic would make things difficult for LCCs but Mr. Horan certainly must know to never count Southwest out of a fight. Either they’re waiting for Ryanair to make the plunge and let them do the dirty work of they’re simply looking for kinks in the armor to launch their own spread. Out of where? BWI. FIS in place, one of their largest operations, dead center between Washington and Philadelphia with some 10 million people looking for potential options. To where? Follow their model. ORY instead of CDG. LTN instead of LHR or LGW. CGN instead of FRA. BRU and not AMS. Close enough, underserved, open skies and cheap. And the big boys would be virtually powerless to do anything about it. Love the dialogue, encourage the debate and thanks for maintaining an open forum. Optimist – The point of these joint ventures is to effectively split the revenue down the middle. The United/Lufthansa deal (Atlantic Plus) has them splitting the revenue down the middle on every seat sold over the Atlantic. There are adjustments made at the end of each time period if one airline is taking more than another onboard, but it’s effectively split. That’s what all these new antitrust immunity deals will do. It’s important to separate general alliances from joint venture deals, as Hubert ties to do here. Right now, Air New Zealand is part of Star Alliance but there are no revenue sharing deals in place. Star members can use their status and earn miles, etc on Air NZ, but there is no revenue split on that LAX-London flight. The United flight from LAX to London, however, will share revenue with Lufthansa. So the LAX-London route is probably one of the most competitive European routes around. You have Air NZ, UA/LH, BA, AA, and Virgin Atlantic. AA and BA are trying to establish antitrust immunity, but we’re still waiting to see what happens. If that goes through, then you still have four separate competitors. And yes, Virgin Atlantic is the one wildcard, but there have been rumors about them joining up with bmi/Lufthansa. It appears that the key differences between joint ventures and general alliances was mentioned but not succinctly spelled out. That led to my supposition/question regarding 50-50 split in revenues and supports Mr. Horan’s concerns. If anti-trust does go thru for oneworld it will be very interesting to see what reductions, if any, AA and BA make on overlapping routes. If they do cut service the follow-on question will be whether or not it drives prices up. New York – London, in my opinion, will always be cheap, even though there are no longer some 20 different airlines flying that one route as there had been before. If nothing else, it would seem that the state of the global economy will always have significant input regarding the health of consumer spending and airline gouging (see LAX-SYD right about now). “(see LAX-SYD right about now).” Oddly the Delta SYD-JFK return fare is the same as their SYD-LAX return fare ($A1100). Interesting rebuttal. However, it would have been interesting to see some profit figures in this argument as it always seems to me that many carriers only make profits in the peak years of the economic cycle. Also the domestic figures may also indicate that in that ultra-competitive sector where low-cost airlines are able to compete, that these fares are in fact cross-subsidized to some extent by higher and more profitable long-haul routes. I know that BA has struggled for many years to make it’s short-haul business pay and has relied on premium trans-atlantic traffic for the vast majority of its profits. From my standpoint, although I want to enjoy low fares, I also want to see healthy businesses that are able to invest in new more efficient aircraft as well as revamp cabins and new services. I guess the problem here is that in many cases at the congested airports the airline industry isn’t really a free market as legacy carriers are always going to do their best to hold on to their lucrative slots at all costs. So if anti-trust is not going to deliver profitable businesses without hurting the consumer, what is the answer? Good points. But I think we need to put these findings in perspective. From 1999 to 2007 North Atlantic fares (a market I know quite well as a passenger) are up 40%. In the same period of time, inflation as measured by CPI-U has gone up almost 28% and the price of crude has gone up about 275%, from about $20 to $75 a barrel on average. Therefore an increase of 40% in fares seems reasonable. I would actually suggest that domestic fares are the ones showing an unusual trend with a huge decline in prices (when taking inflation into account). 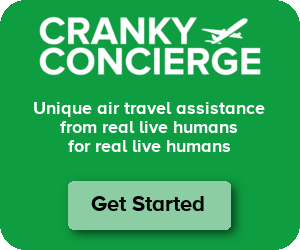 I would almost completely believe that the airline industry is not unlike the US auto industry, loaded with self-serving fiefdoms and immovable cottage industries that need things to stay exactly as they are to support homes, villages and supply lines built over decades of necessity, lethargy and opportunity. Recall the route application just for ORD-Tokyo when whole regions of congressional representatives argued in favor of UA over AA to support jobs as far down the food chain as electronic wiring workers and other small businesses dependent on the traffic and fees generated by this one flight. The irony is that I bought a $600 ticket to Australia largely because neither the industry or the global economy is healthy. I wouldn’t be going otherwise. Stop press! Someone who worked at Swissair-Sabena thinks alliances are a bad idea! Doh! As I said in my earlier comment http://crankyflier.com/2009/04/13/why-international-alliances-are-good-for-you/#comment-72508 I have the impression that currently the transatlantic market is fairly competitive and as a passenger I value the alliance services, single check in and code sharing that allows booking of reduced fare tickets on a combination of airlines. I also voiced concern about potential of price-collusion, and you (Hubert) wrote it up far better than I could. With airline mergers taking place at both sides of the ocean (KLM merged with Air France, Delta with NorthWest) competition becomes less. With BA in talks with Iberia, AF/KL eyeing Alitalia and Czech and LH talking and buying too, consolidation in Europe is happening faster than in the US. The biggest impact of this consolidation will off course be on the European market, but it will also have an impact on the intercontinental markets from and to Europe. If the alliances are allowed to collude they can control the intercontinental markets (they have a fine-grained local feeder network). Three parties is a very small number to ensure competition; competition is secured better when there are six to ten parties with decent market share in a market. It’s funny how the objections are coming NOW in full force, but not a peep over DL/NW/AF/KL, or the Star Alliance approvals. Now that AA/BA want anti-trust immunity everyone thinks it’s suddenly a bad idea. Good for the goose = good for the gander. Good stuff! I’m sure the European Commission would like to hear about this. Could the collusion be allowed under the condition that these airlines give up significant proportion of slots at major airports in the two continents? Yes, this would defeat some of the purpose for these airlines but if they can handle it, so be it. And those reserved slots could be used by Virgin Atlantic and a few others that choose to go it alone. Just another thought as I look at the graph – fare is just calculated by dividing revenue/enplanement. But is this a fare comparison for domestic/international? It would be interesting to see a comparison between domestic and international coach fares. I feel that if premium international reservations were taken out of the equation, we might see a much lower discrepancy. Dan – I asked Hubert that same thing about class of service, and it does include all classes. I tend to agree that coach-only would possibly look different, but both ways of looking at this problem have merits. That’s why we have people coming to opposite answers to the same problem, I suppose. How about a break out showing each alliance and their respective fare changes? Dan and Cranky, he’s comparing same two things over time. The only difference would be if the two products somehow changed significantly over time, which has some truth in it as the long haulers have not been able to emulate the LCC model. But still I don’t think that can account for the huge gap in prices. Oh, the analytical juices are flying now! Randy, where are you!?! As a high-level, revenue to enplanement is the easiest approach for we all know that capacity adjustments alone make it difficult to review something over a great period of time. Heck, Mr. Horan’s own data is quoted as being from eight years ago! I do agree that to clean up the apple cart, a review of pure domestic US will tell one story while point-to-point international will tell another. THEN add in which alliances were only just forming (oneworld is 10 years old) and what share of revenues migrated to that umbrella versus pure carrier traffic. It would be interesting to see the gains under the alliances away from the independent airlines and consider if that revenue is now “protected” via the alliance or lost to a competing joint-venture. With yields that high across the Atlantic, I can see why Ryanair’s O’Leary is looking to get in on the market. I would have to differ about the prices. I have been flying to Europe out of ATL for ten years (3 times a year, all vacation on the lowest fare). If we ignore taxes (and flying into the UK, taxes are very high), a flight to Europe on the lowest available coach fare is not much more than flying between two cities in the states that do not have LCC’s. What I am saying is that ten years ago I could get a ATL-CDG flight for $600, and an ATL-BUF flight for 400. The fares are largely the same today as 1999, except that oil was at $15/bbl then and now is at $50/bbl and inflation has been about 30% over that period. The fact is, airlines have not kept pace with inflation and non-premium passengers still can get a great bargain. Even looking at fares from Summer ’07 when the Economy was at it’s peak, fares were still at close to a historical low. Referencing your experience with Sabena and SwissAir, the major problem with those airlines is that they really only had a few destination’s. Outside of flying into Brussels, Sabena had very little route structure. At least with AF, BA, and LH, they offer more than one destination. The small flag airlines cannot compete in an age of globalization, and that is just a function of economic evolution. Again, for the non-premium flier, fares have not changed that much in the last ten year, and inflation adjusted have declned on many routes (and oil price adjusted, have plummeted). How alliances have impaced these prices is almost impossible to tell, given that we do not have impericle data to look at with or without alliance. But what we can say is that fares have not kept pace with airline costs. Oooh, harsh! Sabena was fantastic if you wanted to fly to, errrr, Rwanda and Congo… Think of how the Little Rock to Bujumbura market got opened up by the Qualiflyer alliance?! LOL…perhaps I should have said, “Unless you wanted to fly into BRU, or any former Belgian Colony in BFE Africa (no pun intended)”…We all know Sabena that cornered the Tulsa to Bujumbura market! This is all very heavy, but from my point of view (like most on here, I fly a lot) I don’t want to see all of that North Atlantic traffic gobbled up by just 3 massive groups of airlines. We need real competition and if that’s going to get taken away then these Alliances need to be prevented. Along with software companies and banks, airlines are one of the few commercial operations that can basically treat their customers like dirt, have exemption from all sorts of laws protecting consumers and still get away with it. Giving them more opportunity to screw us over isn’t going to be good for anyone. Perhaps I am too simplistic, and I admit to being bamboozled by some of the lingo used by some people who are clearly in the industry on here, but I pay my money, I fly and I want to make sure that I have a choice of who I fly with which is not limited to just 3 groups of airlines. Make them compete and take away these cozy little arrangements. Is There Such a Thing as a “Good” Bag Fee?